Your dependency on technical indicators will surely be reduced after you get introduced with the great Fibonacci retracement tool. Traders, who are introduced with Fibonacci retracement tool, even install their trading layout with only a single indicator, generally RSI. I also emphasize on the trading layout with one or two technical indicators installed. Fibonacci retracement tool when drawn starting from a low and ending to a high draws the support levels. In other side, Fibonacci retracement tool when drawn starting from a high and ending to a low draws the resistance levels. Fibonacci Retracement is a technical analysis tool to find the resistance and support levels on forex price chart. The tool is drawn adding a low and a high with a straight line. The tool shows retracement levels at 23.6%, 38.2%, 50%, 61.8%, 100%, 113%, 141%, 161.8%, 261.8% and so on.The first question that come in mind is "Why this retracement levels are important?" These retracement levels are important in forex trading because these levels are closely related with the Fibonacci ratios hence the magical Golden Ratio. You should already know that the Fibonacci ratios are closely related to golden ratio. To make you understand the fact let me explain "How the Fibonacci Retracement levels are measured?" As in the above image, when we draw a Fibonacci retracement tool starting from a high to a low, we get the different retracement levels. These retracement levels actually represent the Fibonacci ratios. For example the retracement level at point B is measure by AB/SE=0.38*100=38%, and 0.38 is a Fibonacci ratio. 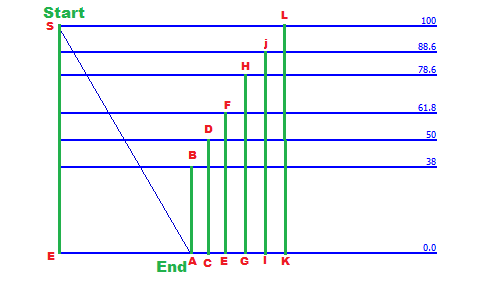 Similarly, all other retracement levels are marked at different Fibonacci ratios. If you already read my post about golden ratio and Fibonacci series you must know the significance of Fibonacci series in the universe. How to trade forex with Fibonacci retracement tool? Both breakouts and range traders can apply the Fibonacci retracement tool in their forex technical analysis. When a Fibonacci retracement tool is drawn starting from a low to a high, the Fibonacci retracement levels represent the support levels. In other way, when a Fibonacci retracement tool is drawn starting from a high to a low, the Fibonacci retracement levels represent the resistance levels. In above image, a Fibonacci retracement tool is drawn starting from a low to a high, and the trend is going down after a reversal. 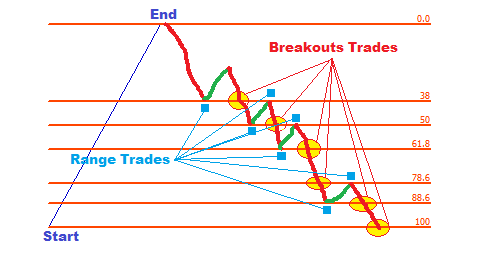 The breakouts traders will be looking for the of breakouts to make an entry in the market, and the range traders will be looking for the trend to reach a Fibonacci retracement level that represents a strong supports. Another important fact is that when a Fibonacci retracement level is broken by a down trend, it becomes the resistance, and the range traders will consider it to place a sell order. In the above image, a Fibonacci retracement tool is drawn starting from a high to a low, and the trend is going up after a reversal. 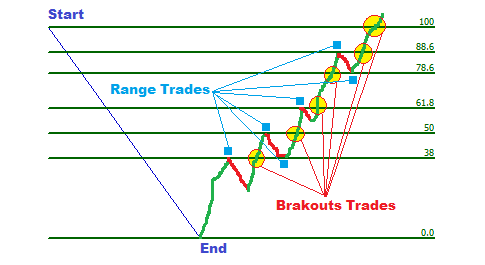 The breakouts traders will be looking for the of breakouts to make an entry in the market, and the range traders will be looking for the trend to reach a Fibonacci retracement level that represents a strong resistance .Additionally,when a Fibonacci retracement level is broken by an up trend, it becomes the support, and the range traders will consider it to place a buy order. No, trading both breakouts and range with Fibonacci retracement tool is not easy as it sounds. There are so many facts that should be considered to find the reliable entry and exit in forex trading. Even stop loss and profit traget can also be selected by the Fibonacci retracement tool. Most important fact is that all Fibonacci retracement levels are not equally effective in finding the entry and exit signals. There have so many techniques to measure the reliability of a signal by the Fibonacci retracement tool. We will learn those through the next posts. If you have any question, you can drop it below.You can enter your email address in the subscription box to receive the updates.